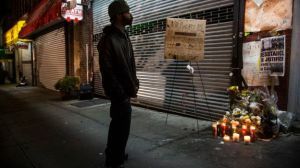 We take a look at the decision handed down this afternoon by the grand jury in New York, not to indict Officer Daniel Pantaleo in the chokehold death last July of Eric Garner, an unarmed 43-year old man who was suspected of illegally selling single cigarettes. Our panel of guests includes: Rinku Sen, President of Race Forward and Publisher of Colorlines; Rev. Dr. Heber Brown, community activist and Pastor of Pleasant Hope Baptist Church; and Dr. Karsonya “Kaye” Whitehead, Assistant Professor of Communication and Affiliate Assistant Professor of African and African American Studies at Loyola University Maryland.